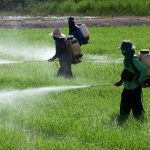 The shorelines of Thailand are a main draw for tourism, but for those who've watched Jaws one too many times, there may be some fear around swimming and diving in the turquoise waters of Thailand. It's easy to fret about the potential of sharks in the water, but while there are indeed sharks in Thailand, they’re more friend than foe. Shark attacks are incredibly rare in Thailand, with just one confirmed death, one anecdotal account of a death and a few bites over the years – we'll look at those in more detail later on. Fortunately, most species of shark in Thailand are completely harmless, so those with a phobia can rest assured they generally won’t see a dorsal fin – unless they specifically go diving to see one. 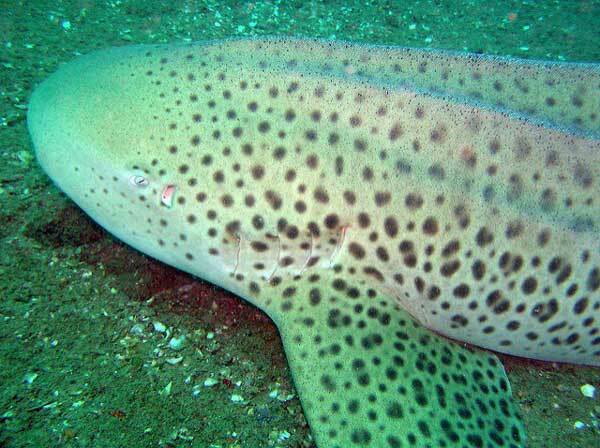 Features: Small in size and distinct in appearance, the slender Leopard Shark is often covered in dark spots. It has two distinct dorsal fins, and rarely reaches any longer than four or five feet long. Diminutive and shy, these sharks are easily spooked by humans and like to hide from larger animals. Seen: Leopard sharks can be found around Thailand’s Similan Islands in the Andaman Sea, as well as around Phuket and the Phi Phi Islands. Risk to Humans: Exceedingly shy and unlikely to interact with humans, the Leopard Shark is of no threat to humans exploring its habitat. Features: These brown, marking-less sharks are small in stature, only growing to be two and a half feet long. Bottom dwellers, these sharks lay their eggs on the ocean floor and consume small shrimp, mollusks, and crabs. Seen: Found all over Thailand, both in the Andaman Sea and the Gulf, near Koh Dok Mai, Anemone Reef, and Shark Point. Risk to Humans: These small sharks often like to congregate with others of their kind, and are generally frightened of humans. They pose no threat. Features: These sharks are easily identified by the black bands on their dorsal and caudal fins. They reach an average length of about 5 feet. Seen: These sharks prefer inhabiting shallow waters near tropical coral reefs, though they also inhabit sandy flats. In Thailand, these sharks can be found along coastlines nearly everywhere in the country. The best places to spot them are in the Phi Phi Islands or the Similans. Risk to Humans: Known for their timid demeanor, Blacktip Reef Sharks often flee from humans, except if the promise of food is present. If the sharks are near shallow water, waders should exercise caution, as there is some risk of having a leg bitten. Features: These sharks rarely grow beyond 5 feet and are incredibly slim, with broad heads, nostril flaps, oval eyes, and dorsal and caudal fins that have a characteristic white tip. Seen: Divers near the Similan Islands are likely to see Whitetip Reef Sharks, which tend to frequent deep drop off points. Risk to Humans: These sharks rarely display antagonistic or aggressive behavior toward divers — though the sharks may get close to investigate swimmers. 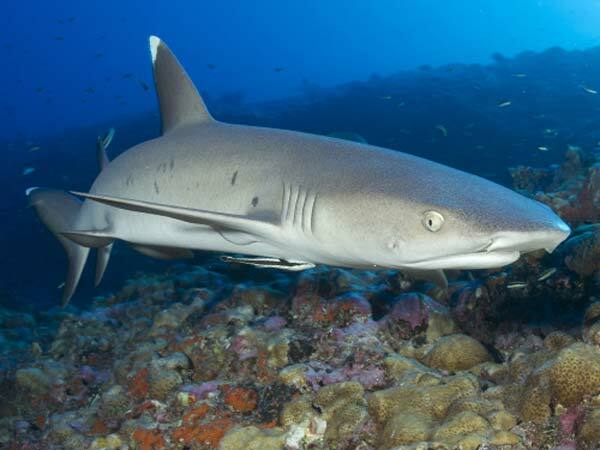 Spear fishers may experience more aggression from a hungry Whitetip shark trying to steal their day’s catch. Features: These massive creatures have an average length of between 30 and 40 feet and typically weigh over 40,000 pounds. Massive and with a gaping mouth, these sharks are noted for having wide, flat heads; two dorsal and pectoral fins, and pale yellow speckles on their backs. Seen: While Whalesharks can be spotted anywhere in Thai waters. 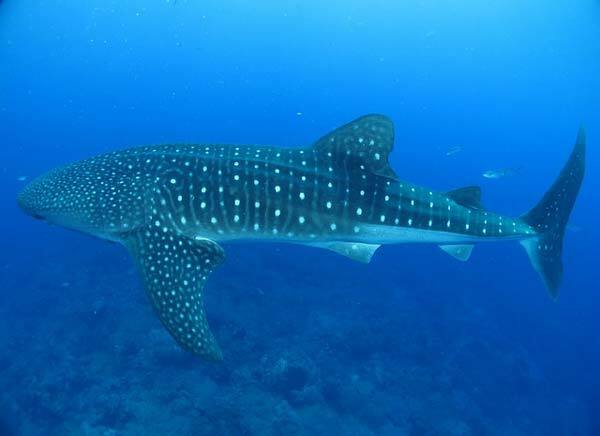 The best places to spot one of these gentle giants are around the reefs of the Similan Islands (notably Richelieu Rock) and Hin Daeng, and the Chumphon Pinnacle in Thailand’s Gulf. Risk to Humans: Since these large sharks feed exclusively on plankton, they pose no threat to humans. 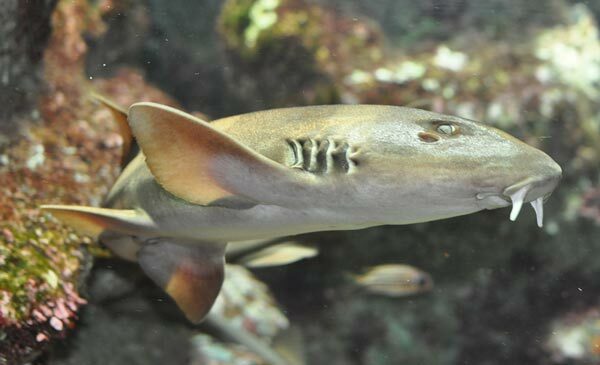 Features: The Nurse Shark grows to an average of 8 feet long, is brown in color and sports two dorsal fins and pectoral fins that are characteristically rounded. The sharks are also known to have broad heads. Seen: Nurse shark sightings in Thailand are rare, though lucky divers can spot them amongst the rocks of the Similan Islands. These sharks prefer to dwell near coral reefs or sandy areas sheltered by caves or crevices. 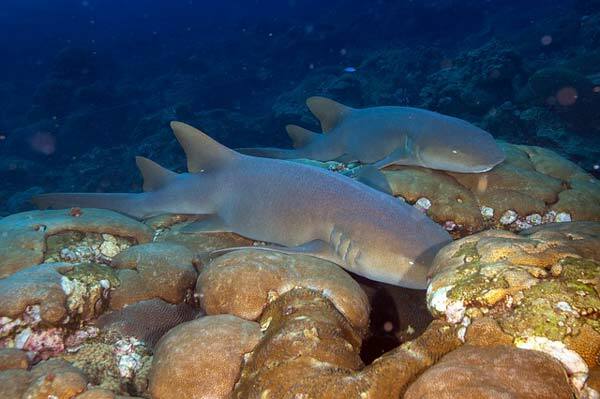 Risk to Humans: Though these sharks seem calm and slow-moving, it’s best to exercise a caution around them — after all, Nurse shark bites are the fourth most common shark bite to humans. Divers should be cautious around its natural habitat and give them a wide berth if sighted. Features: These sharks are likely what you picture when you think of a “typical” shark: They have wide, round snouts, large eyes, and grow to about 6 feet long (or less). Their tail fin is often outlined in black, and the back between its fins is often smooth and rounded. 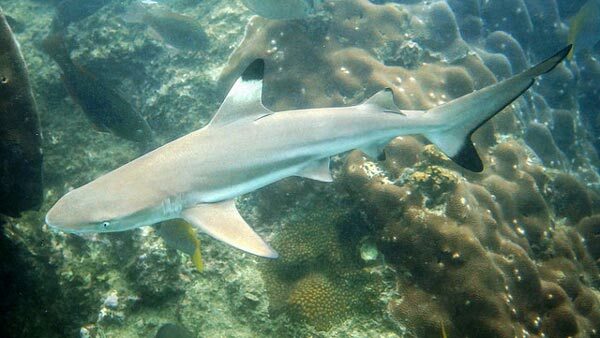 Seen: It’s rare to spot a Gray Reef shark in Thailand, but divers can see them in dive sites near the Similan Islands (Christmas Point, Deep Six, or Elephant Head). Risk to Humans: Though shy, these sharks are known to attack divers, but only if they are feeling cornered or threatened. In response, they transition into attack mode, dropping their fins and beginning to swim in an unsettling zigzagging pattern. If you spot one, it’s best to give the animal plenty of space. Features: These sharks are quite large, growing to nearly 16 feet (or larger). These sharks have stripes on their sides, which explains their name, though these markings tend to fade as the shark grows older. These animals have two dorsal fins and five characteristic gill slits. They have narrow snouts and serrated teeth. Seen: Tiger sharks are incredibly rare in Thailand, preferring cooler and deeper waters. They do exist in Thai waters, however, likely around the Surin Islands. 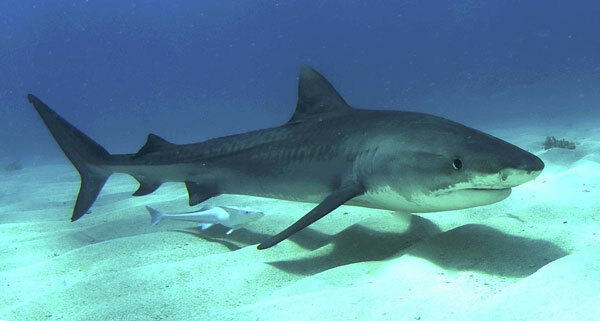 Risk to Humans: Responsible for the largest percentage of fatal shark bites to humans, the Tiger shark is not to be underestimated. Fortunately, the sharks don’t bite often. 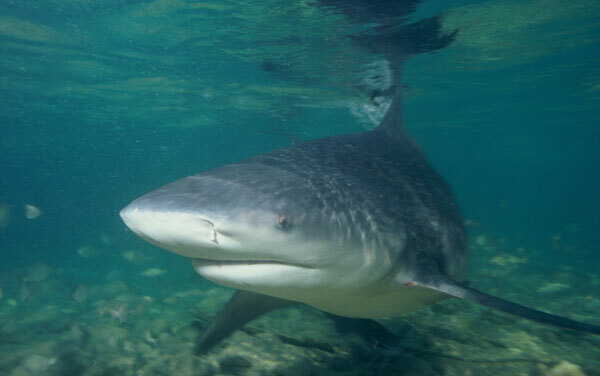 Features: A Bull Shark can grow to nearly 12 feet (though the average is about 7 feet). These animals have a rounded snout (like a bull), and exhibit a large, triangular dorsal fin. These sharks are grey with white bellies, and have sharp, jagged teeth. 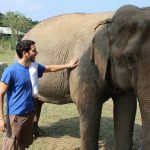 Seen: Though seeing these animals in Thailand is rare, they do occasionally turn up at Hin Daeng and Koh Tao, and at Chumphon Pinnacle in the Gulf area. Risk to Humans: There’s no denying that Bull sharks are dangerous. They’re responsible for many unprovoked attacks and can show up in both rivers and freshwater. Fortunately, though some of the sharks in this list can and may bite, documented cases of shark killings in Thailand are incredibly rare. The last seems to have been in 2000, when a German diver named Stephan Kahl emerged from the waters around Phang Nga Islands with severe bites and blood loss. Though no shark was ever identified in the wake of his death, the bites indicate he may have been killed by a Tiger shark. “It is likely that he was bitten by a shark”, Pol Lt Suthas Promaksorn said, though he added that no shark sightings had been reported in the area. German embassy officials were unable to provide further details of the case. Local residents said the man might have been bitten by a brindle bass rather than a shark, but fisheries experts said these fish had never been known to attack people. The brindle bass can weigh up to 100 kilos, but is thought to venture out of undersea caves very rarely. Though fatal shark bites are few and in between, there have been instances of sharks biting swimmers, divers, and fisherman. In 2015, an Australian woman named Jane Neame was bitten on the foot and ankle at Karon Beach in Phuket. She told us that she was playing in the waves where the water is about one meter deep and that suddenly she felt something biting her foot. She says it was a strong bite, and then a second strong bite with a bit more shaking. The animal must have had rows of triangularly shaped teeth side by side laterally, with a wide base because the clear teeth marks on the bottom of the foot were wide on the skin, deep and also side by side. The only animal that could have caused this bite, given all the information, is a small shark. The location of the incident, shallow, murky water with a sandy bottom, is the habitat of one such species, the bull shark. In 2001, a 10-foot shark is said to have bitten the legs of a fisherman who fell off a banana boat in 2001 at Laem Mae Pim Beach in Rayong Province. The species was never confirmed, but sighted to be 3m in length. 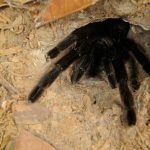 In 1966, a 28 year-old Thai native named Vinit Tantikarnwas said to be bitten, though due to poor record taking, the geographic location of the bite is unknown. 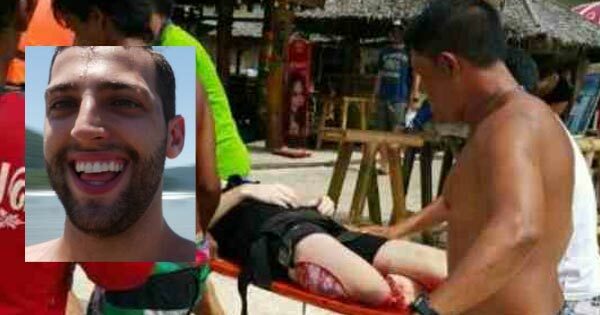 Perhaps the low number of shark bites and deaths in Thailand can be attributed to the vigilance of local villagers, as unfortunate tourist David Smith found in early 2018. What makes this story so bizarre is that it wasn't a shark in the water at all. Smith, on a vacation to Pattaya with friends, decided to don a fake shark fin to scare his swimming companions. He was almost immediately hit by nine harpoons from local fisherman. Badly injured, he’s now in stable condition. His friends saw him rapidly emerge from the water, screaming with pain. We never even saw David or his fin approaching.We just saw a bunch of fishing boats hurrying past us and firing dozens of harpoons. He got his head out of the water and yelled ‘I’m not a shark!’, but he was immediately hit by two other harpoons. Let this be a lesson to anyone thinking of playing this prank! The first question on the mind of someone with a shark phobia visiting Thailand is whether or not they will encounter a Great White Shark, just like the one depicted in the Jaws movie I referenced at the start of this post. You can sigh a sign of relief now, though. Even those diving in Thailand will not see a Great White Shark because they are not known to exist in Thai waters. Seen a shark in Thailand? Let me know in the comments! In the first days of this December we took a day trip to Phi Phi Islands and on the way there the guide said that there was a shark reported in the waters near the islands. He didn't mention which shark it was, but gave us another location for snorkeling: Bamboo Island instead of Phi Phi. Hmmm, could have been a bull shark. I have dove with multiple Bull Sharks on the Chumpon Pinnacle. A Whale Shark off Sattahip on the Hardeep wreck. White and Black Tip's on the deeper Similans sites. Leopard and Bamboo off Similans and Hin Daeng/Hin Muang. Nurse Sharks off Pattaya. They are there if you know where to look and get lucky. Wow. 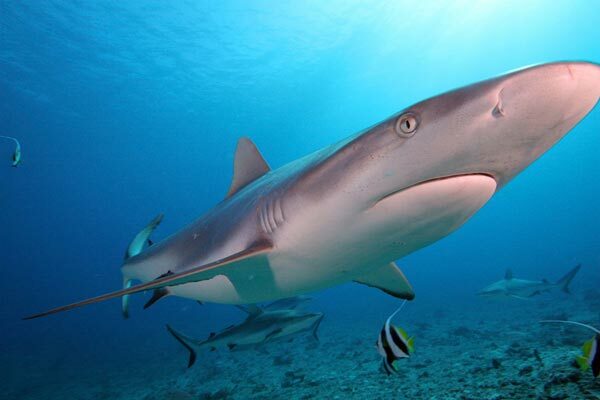 Bull sharks are very rarely seen but they do exist in Thai waters. I'd probably tell the locals. How far from shore were you?